Everything old is new again – Chrome is now pushing “browser profiles” as a major feature: https://support.google.com/chrome/answer/2364824?hl=en . Profiles are actually really useful… as you’ve just demonstrated. I’ve got several setup for various duties… and one that I always called “blank” (saves/accepts nothing) for testing. Talk to some web developers around you. I’d be surprised if quite a few weren’t using them. I don’t think the article at all justifies your topic or conclusion. It’s a complex area and no one entity is ‘to blame’. Firefox is a web browser for people to use to view web sites, it is not an SSL certificate verification tool; there are plenty of those. I don’t think you presented a strong enough argument that Mozilla did anything at all *wrong*, per se; they made a questionable judgement call that it’s more important to help their users view sites that they are confident can be trusted than it is to act as the SSL Cops (which is something Mozilla does a very good job of in less prominent ways, btw, so it’s really a shame to be so eager to get the boot into them). When you’ve got two parties who unambiguously did something one and one which maybe did something debatable, prominently saying the third party is “responsible” is not justified. Well, you’re not wrong. To my credit, I did point out in the very first sentence that Mozilla is not responsible. And that they’re a good company, and that I hold them to a higher standard. I then said they “set the stage for this to happen” and they did. 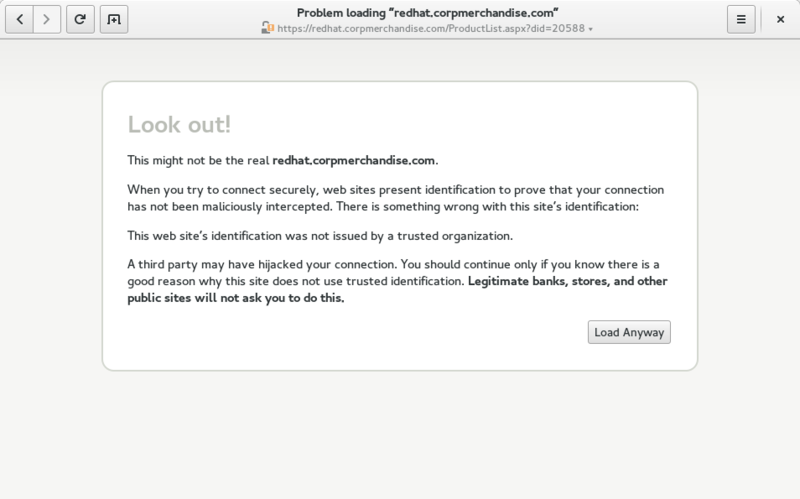 This isn’t just an issue with one particular site, it happens with other sites too, which neither Staples nor Red Hat can do anything about. E.g. my university ran a ludicrously important web site for several years that only worked if you first visited another university site. The tech support people noticed the problem only occurred for new students or on their regularly-wiped testing computers, and thought it was some sort of feature of the university network that was magically capable of automatically installing certificates on your operating system…. This problem only occurred because Mozilla went to extreme lengths to make it a problem; it’s not really reasonable, I think, to expect site admins to perform magic incantations with Firefox profiles (or even know about Firefox profiles) to make sure their site is deployed correctly. I don’t care too much about Staples, but I do about the larger issue, and a fix can only come from Mozilla, so they’re the ones who deserve a little pressure. (Or, well, another major browser vendor could change too — anyone know if Internet Explorer and Chrome on Windows cache intermediates too? — but there’s a faintly realistic chance of convincing Mozilla to change, so let’s focus on them.) Caching certificates is not just good for Firefox at the expense of other browsers, it’s good for certain Firefox users at the expense of other Firefox users, and that is not how a responsible browser vendor should operate. I don’t agree that Mozilla doing a “very good” job of acting as SSL cops. It is probably doing better than any other player in this space, that is true, but that’s not a very high bar, and this was just one particular complaint I could make out of many. It is still supporting RC4, for instance (after an initial handshake attempt without it fails). The dithering over whether to drop insecure initial negotiation is quite disheartening; they’re probably going to adopt a whitelist of broken sites and treat them differently, not to mention completely undo this when TLS 1.3 is implemented, which discourages other browsers from improving. (This in particular is a wonderful mistake to talk about — a very small minority of servers just crap out when a browsers says it supports a higher TLS version than the server knows about. At the time, tolerance of these servers at the expense of security really was important to keep the Web working, but nowadays it just makes us all less secure. These servers will mostly all be fixed once a major browser vendor puts a foot down, but nobody wants to be first.) Mozilla accepts certificate chains sent completely out of order, when that is one of the only actual standardized constraints that browsers are not supposed to permit. Their laudable effort to stamp out 1024-bit RSA roots was done with no consideration of ca-certificates users other than NSS; we’re walking into a future where Epiphany will only work properly on Fedora since the NSS guys reverted their changes downstream. And more and more. Mozilla is not just more conservative about breaking broken sites than it should be, it is dramatically more conservative than I find reasonable, to the detriment not only of the security of Firefox users, but also of users of other browsers. But still, to be very clear, these criticisms only apply to their terrible (you can say “debatable”) choices regarding HTTPS. Mozilla is a good company. They try to do good things. They mostly succeed. Firefox is not just a good browser, it’s the only major cross-platform browser worth using, because it respects your freedom. Yay for Firefox. One thing everyone should do when deploying a web site with SSL is to check it with a service like https://www.ssllabs.com/ssltest/ – there’s a few others too. It’ll tell you about misconfiguration, software bugs, and (of course) missing intermediate certificates, without having to futz with browser profiles and stuff. SSL Labs is great. They have a good server test and a good (lesser-known) client test that I use regularly. Ivan’s book “Bulletproof SSL and TLS” is excellent. “This server is vulnerable to the POODLE attack against TLS servers. Patching required. Grade set to F.” OK that’s bad and that grade makes sense. “This server is vulnerable to the POODLE attack. If possible, disable SSL 3 to mitigate. Grade capped to C. ” Fair enough, though I don’t think this is a big deal since browsers don’t allow SSLv3 anymore. “This server’s certificate chain is incomplete. Grade capped to B.” Erm, this should be an F. The chain issues under Additional Certificates and Certification Path should show up in red, not orange. TLS 1.3 intolerance should get it capped to a D (or thereabouts) but does not affect its score at all. Yeah – no. 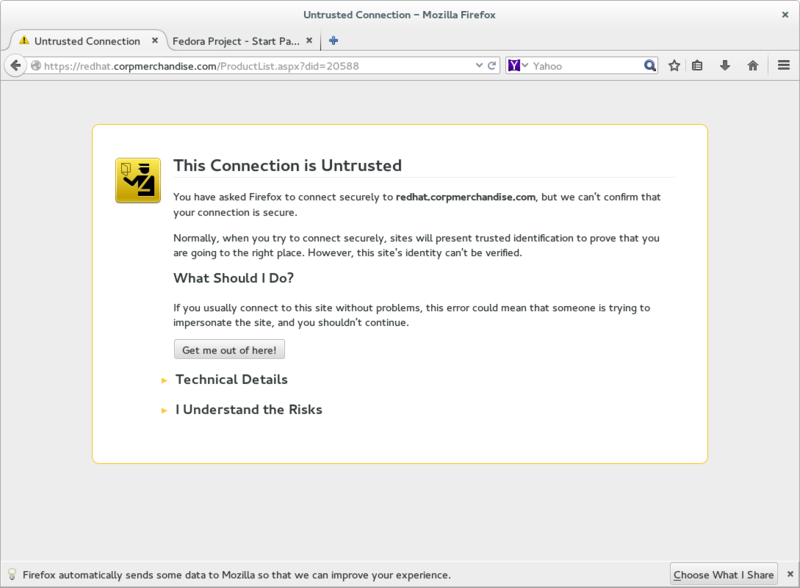 Firefox is doing the correct thing here, GNU TLS is broken… The client end needs to store intermediate certificates for cross-signing purposes. TLS only allows for a single chain to be transmitted, which may or may not be the one that the client is expecting. In a B2B situation, there is no guarantee that server and client will agree on certificate chain. So, e.g. if I need my web-browser needs to connect to another company’s web-server, their root certificate will be cross-signed by mine. The chain and intermediate sent by the other company’s web-server will not be the correct one for me to use. I’m not sure if you have a point or not, because I don’t understand what you’re saying. Why is caching related to cross-signing? Why would you ever want to transmit a chain if you don’t intend the client to use it? In particular, what do you mean when you say “the server and client will agree on a certificate chain” — there is no negotiation involved here, the server sends a chain and it’s either good enough for the client or it’s not. If Company A’s root cert is signed by Company B, and Company B’s signing cert is in the root store of Company B’s computers, then the connection will work. If not, then it should not work: and why would you expect it to work? and why would you send more than one cert in this case? I like what Mozilla is doing here. Their purpose is to serve the user. The important issue for the end user is to verify the identity of the website. Mozilla’s working over-time to do that, so that the user can carry on with his web-browsing, and purchasing. The proposal seems to be that Mozilla should serve the server admin instead of serving the end user, if the server admin is too lazy to visit https://www.ssllabs.com/ssltest/analyze.html?d=redhat.corpmerchandise.com (which, apparently, he is: still vulnerable to POODLE). I disagree! I also agree that the caching that Firefox does is good. Internet Explorer/Microsoft does even more and either ships all/most intermediate certificates or uses the “Authority Information Access” extension from the server certificate to get missing intermediate certificates. So there also websites that were tested with IE and worked, but do not always work in Firefox. Here the answer should not be to make sure that these websites never work in Firefox. Also caching allows to speed up connecting to websites, if the browsers remembers that the intermediate certificat is valid, it does not always need to check the complete chain.